If your business is in the market for a top quality, budget-friendly office computer desk, ROF Furniture is the place to shop. We carry all of the best, highly respected and well-known national brands out today at the most affordable prices. Whether you’re looking for a traditional, classic, modern or contemporary office computer desk, we have a vast variety of choices to suit your requirements and taste. 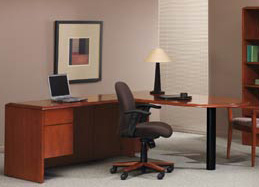 Whether the office computer desk is new or used, we stand by the quality of our products. ROF Furniture goes through an in-depth inspection of our furniture to assure you, the customer, that you’re getting the finest office furniture you can purchase. ROF’s office computer desk selection can also come with a hutch to provide you and your employees with extra room to store all your books, files and mementos.